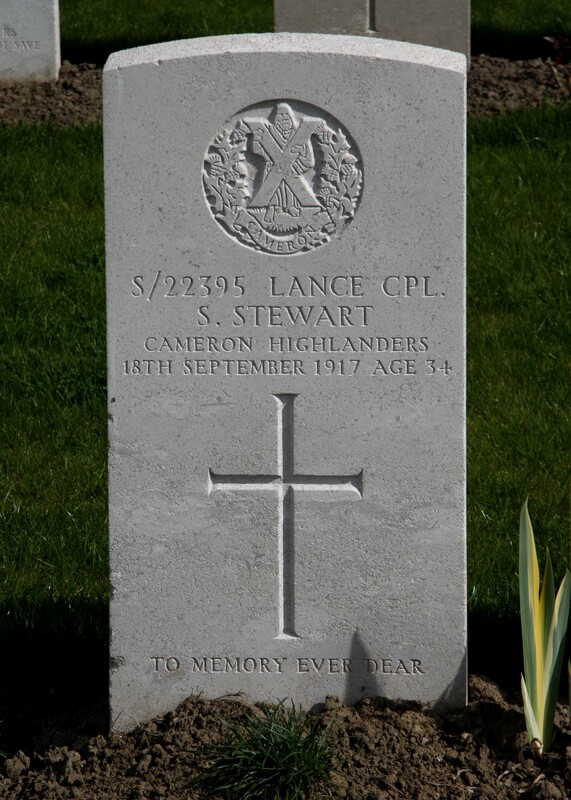 Stewart’s grave in the Birr Cross Roads Cemetery, Belgium, courtesy of the War Graves Photographic Project. The RBGE Guild’s publications are invaluable to those researching RBGE’s 20th century history. Based on Kew Garden’s Guild which is still in existence, ours was established in 1913 to act as a conduit for past and present members of staff to keep in touch. It is a fantastic source of information for the RBGE historian as it lists members of staff, has articles about everyday happenings, and even memories gleaned from retired members of staff. Walter Henry Morland was the catalyst behind the formation of the Guild, having come from Kew Botanical Gardens and seeing for himself how effective their Guild was. He became the RBGE Guild’s first Secretary, and was closely supported by Samuel Stewart, the first Treasurer. The Guild’s Roll of Honour published after the First World War in 1925? states that “the successful inauguration of the Guild was in large measure due to [Stewart’s] interest in the objects of the Guild. His work in co-operation with the Secretary made possible the issue of the first number of the Journal.” Both Morland and Stewart are named on the Roll of Honour, the list of RBGE staff who did not survive the War. Morland was killed in 1915 in Gallipoli; his story is told here. 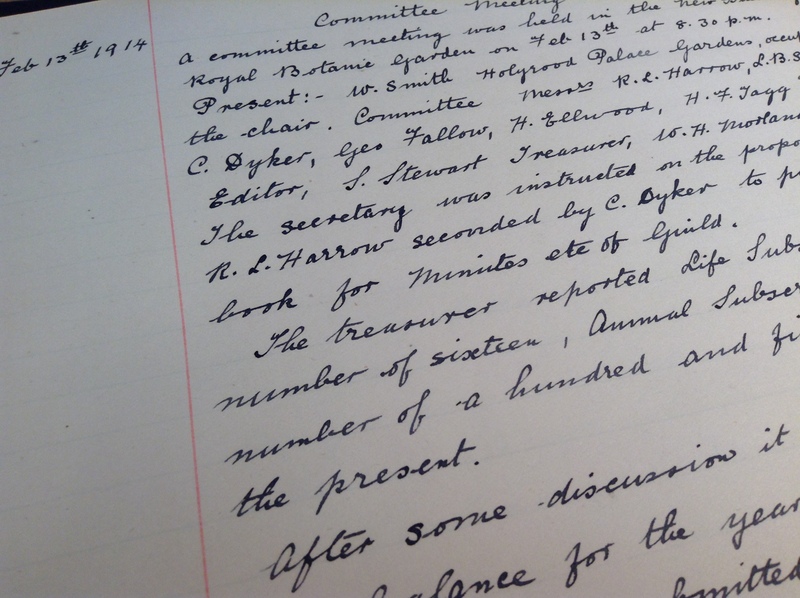 One of the first Guild Committee meetings – we can see S. Stewart named as Treasurer. Samuel Stewart was an Edinburgh man, born on the 26th September 1883 in Cramond to Henry Stewart, a Railway Inspector, and his wife Margaret. He was educated at Daniel Stewart’s College and began his employment at the Royal Botanic Garden Edinburgh as Assistant Head Gardener on the 11th May 1908 at the age of 24, which would imply that he must have had significant training and experience as a horticulturist, but we don’t have the records to show what this was; the 1901 census tells us that at that time he was a Railway Clerk following his late father and two elder brothers into work on the railways. Becoming Assistant Head Gardener just 7 years later seems quite a jump from this. However, it seems that his job title was perhaps more of a ‘grade’ than a description as his duties seem to have been clerical; something he would have had ample experience of. 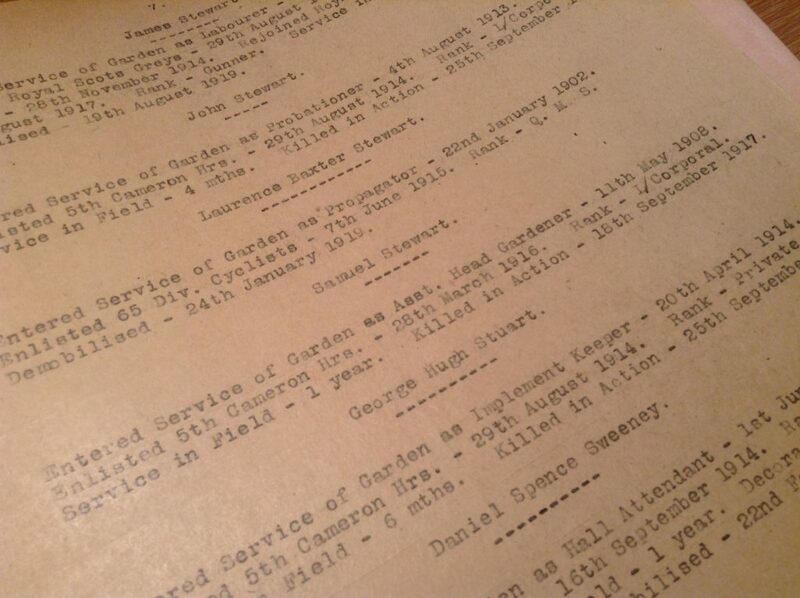 Samuel Stewart’s entry in RBGE’s Service Roll. Photograph of Sam Stewart sent to RBGE by his mother. Possibly due to his senior position or his older age, Stewart did not enlist at the outbreak of War in 1914, remaining in his post at RBGE until March 1916 at which point he enlisted with the 5th Battalion of the Queen’s Own Cameron Highlanders as a Private, crossing the Channel to France a short time later in July 1916. He was soon promoted to Lance Corporal – the impression one gets is that Stewart was a capable man and a fast learner. 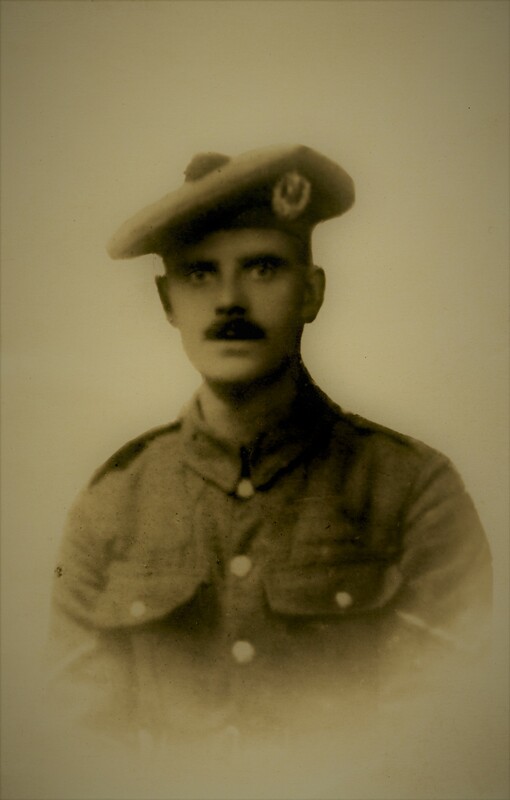 As a Cameron Highlander, the major offensives Stewart would have been involved in included the Somme in 1916 and Arras and Passchendaele in 1917. He was to lose his life shortly before the Battle of Menin Road, one of the engagements that formed part of the Third Battle of Ypres, more commonly known as Passchendaele. These offensives consisted of a number of smaller movements working together to form a major push into German territory, aiming to eliminate the notorious Ypres salient. The Battle of Menin Road began on the 20th September 1917. Prior to this, the battalions involved in this engagement were lining up behind the front line, some providing support to others. We know from the 5th Cameron Highlanders’ diary that on the 17th September they marched to Toronto Camp which was located at Brandhoek, a few miles to the west of Ypres, where they billeted in huts, tents and bivouacs. On the 18th they were still in Toronto Camp, but a working party of 300 were sent to do carrying duties for the 27th Brigade. On the 19th it was reported that 4 men from this party were killed. This matched Samuel Stewart’s date of death so one can assume that he was likely part of this working party. The rest of the 5th Camerons remained to the west of Ypres on the 19th before taking their positions on the front line to the east of Ypres. 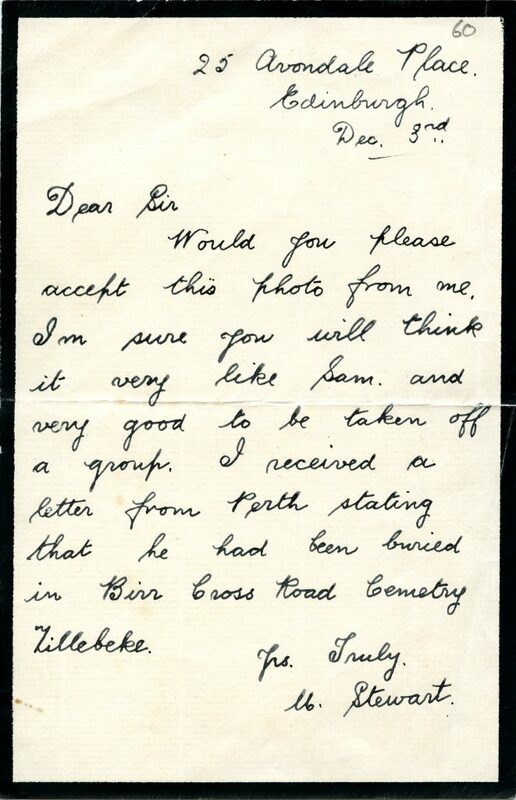 We know from where Stewart was buried that his mission on the 18th must have taken him to the front line as he is buried at Birr Cross Roads Cemetery near Zillebeke on the Menin Road. 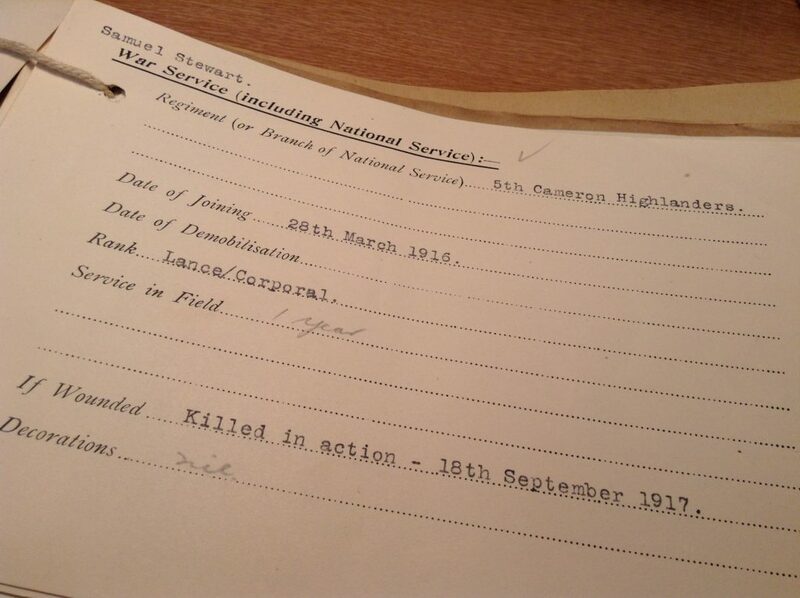 Sam Stewart’s War Service Card at RBGE – we usually see ‘nil’ under ‘Decorations’, this is rarely, if ever, true – Stewart was awarded both the British War and Victory medals.